Full disclosure here: I believe in Ouija boards working about as much as I believe in the average alien abduction. That is to say, not even a little unless I see proof of some kind. That being said, it didnâ€™t matter one bit because this was a great story. 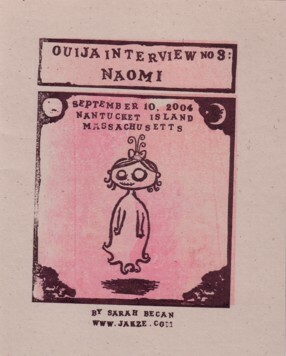 A group of people â€œcalledâ€ on the board (sorry, no idea what the term is) and were answered by a dead young girl named Naomi. She died horribly and misses the boy she had a crush on at the time, who either died with her or is still alive, as she hasnâ€™t seen him. I have no idea of Sarahâ€™s artistic ability from this becuase itâ€™s just images of this dead girl in various poses, but she does a great job with the girl and the backgrounds, for whatever thatâ€™s worth I donâ€™t think Iâ€™m adequately conveying what a blast this comic was, but it made me laugh a few times, and thatâ€™s always a good thing. I have no idea on price, but letâ€™s say $3 at a guess, and the outside is creepily gorgeous.